Gary Mackay: Hearts’ toughest week since administration .. The past week has been the toughest Hearts have had since coming out of administration. 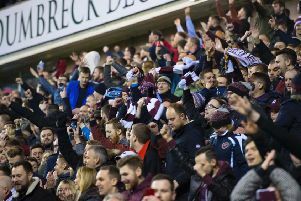 The Scottish Cup defeat by Hibs was a particularly hard one to take because there’s always an expectation among the Hearts support going into a derby. Unfortunately we weren’t able to live up to that. I would have been more inclined to start at Easter Road with the same attack that played at Ross County – Sam Nicholson, Juanma and Jamie Walker. For me, that was a really positive team, whereas I felt we gave Hibs too much respect in relation to what we’ve achieved this season. A lot has been made of the fact we have now gone five derbies in a row without a win, and some of the players have been a bit taken aback by that given how well they’ve done overall. When Alex MacDonald was my manager at Hearts, he used to say you get the same points and bonus money for beating everyone else as you do for beating Hibs, so I can see why players may not see the derby record as such a big deal. However, that doesn’t always wash with supporters, especially when they’ve been used to having the upper hand in derbies. It’s understandable that they’re hurting after last Tuesday. If we’d gone out of the cup to any other side apart from Hibs, the backlash and disappointment wouldn’t have been anywhere near as bad. That’s the power of the Edinburgh derby though. The mood hasn’t been helped by the defeat at Dundee United. Although some of them were enforced, I felt making five changes on Saturday was possibly a bit too much. We seem to lack continuity from one week to the next. Having said that, Jordan McGhee’s red card was probably as big a factor as any in us not winning the game. When you suffer a couple of setbacks in a row like we have, people will always look for reasons, but sometimes we can be guilty of over-analysing. It could just be that we are due a bit of a slump after having such a good season. In light of recent results, the Kilmarnock game on Saturday has now become one of our most important for a while. It’s crucial that we score the first goal to ensure we have the supporters onside and put ourselves back on track.